St. Julia students and staff proved to me they are already incredibly respectful and responsible. That’s probably why our cyber-bullying prevention message was so well received. They were interactive and totally tuned into the songs about respect and cyber-safety. They were wide-eyed as they watched the videos. 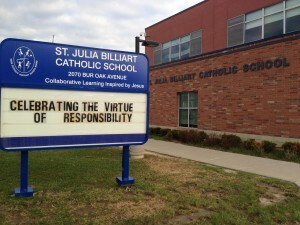 Discussion about bullying and cyber-bullying revealed that St. Julia students understand the word responsibility. I talked to a student who stayed back after one of the assemblies. I listened to his story and offered some advice, based on the research and studies that are out there. He was appreciative and said he would definitely try the strategies I shared both during the assembly and with him personally. Bullying can be complex, but you have to have an open mind and be willing to change if necessary in order to learn to deal most effectively with the situations that are out there. The York Catholic District School Board is obviously interested in promoting anti-bullying strategies to their students. We felt a warm welcome from the students as well as the staff during the entire day we spent with them. Smiles and heartfelt applause followed the role-plays which were acted out by St. Julia students. The student actors took the subjects of respect and responsibility seriously as they shared their messages with the audience through acting. Various cell phones and a laptop computer were some of the props used by the St. Julia volunteer actors. In one role-play, a girl become discouraged and upset because someone sent her a cruel and nasty text message. Luckily, the girl’s friend took her directly to talk to a teacher whom she felt would be understanding and supportive. The audience resonated with the tips included in the song ‘Passwords’, which was sung live by DJ Benny DL in the Junior Assembly. The Intermediate assembly featured videos and discussion. Many students participated in the discussion and the Q & A which followed. So many excellent questions. So many great answers. So many students willing to learn and grow in their understanding of a serious topic. ‘Cyber-bullying, responsibility and respect are definitely connected in a big way’, stated one of the grade 7 students near the conclusion of the Stand Up Against Cyber-Bullying assembly. Bruce Langford is an anti-bullying advocate, author and presenter.